Wonderfully detailed tool box Christmas tree ornaments for this holiday season! 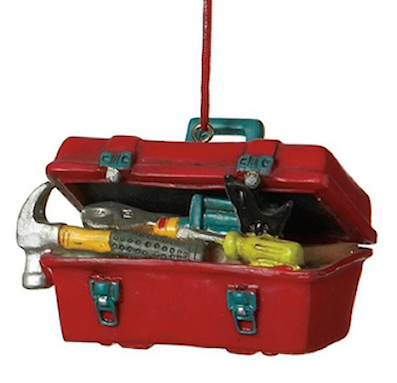 Brighten your electrician, contractor or tradesman's life with an ornament depicting the tools of his trade! These resin tool box ornaments measure approximately 3" x 2" x 1.5". Ornaments are gift boxed. MADE IN THE USA...WARNING!! Don't Touch My Tool Box sticker for Electricians, Engineers, Contractors, Maintenance men and other trades occupations professionals! This sticker is approx. 2" x 3.5" and is high gloss. The sticker has adhesive on the back and is meant to apply back down to most surfaces. This decal would make a fun statement on your toolbox -- because you know you want the guys to leave their hands off your tools! Fun decals to express your opinion! MADE IN THE USA...WARNING!! No Tools Loaned sticker for Electricians, Engineers, Contractors, Maintenance men and other trades occupations professionals! This decal would make a fun statement on your toolbox, your locker door, bucket trays, etc. -- because you know you want the guys to leave their hands off your tools! Fun decals to express your opinion!